I love dishes which combine meat and beans: cassoulet, Boston baked beans, any kind of slow-cooked meat and beans. When I read about the Brazilian national dish, feijoada, in Jamie Oliver's new book Comfort Food, I had to try it, particularly as I had some leftover pork belly slices which I didn't use at Christmas and the remains of a smoked pork picnic shoulder joint. Not to mention a load of the black beans I harvested this year! The end result was lovely: garlicky, rich and definitely worthy of the comfort food label. I had to adapt the recipe to suit my available ingredients and I'm noting them here for future reference, as this is a dish I guarantee I'll be making again. I used my pressure cooker for the first stage: slice the pork belly pieces into narrow strips and fry them until golden. Add the beans, water and ham bone and cook at high pressure for 15 minutes. (If using a regular pan, cook for an hour, or until the beans are tender.) Then remove the bone and transfer everything else into an ovenproof dish with a lid, with the remaining ingredients. Cook at 300°F/150°C for four hours (or use a slow cooker if you have one). By the end of the cooking time, most of the liquid should have been absorbed or evaporated, leaving a thick, glossy coating on the beans and meat. Serve over brown rice. The temperature is forecast to drop to -11°C/12°F tonight, so I seized the opportunity of digging up some Jerusalem artichokes while I still could! There isn't much left growing in the greenhouse, but I did get three bok choi plants and some coriander for our evening meal. The chickens are finally getting their act together, with a respectable clutch of six eggs today. We have eight nest boxes but for some reason they only lay in two of them - and they aren't adjacent. Who knows how a chicken's mind works? I've spent the last couple of weeks taking advantage of some of the milder days by digging over the beds in the lower vegetable garden and adding chicken manure to two of them. This year, for the first time, I'm covering the beds with a winter mulch. 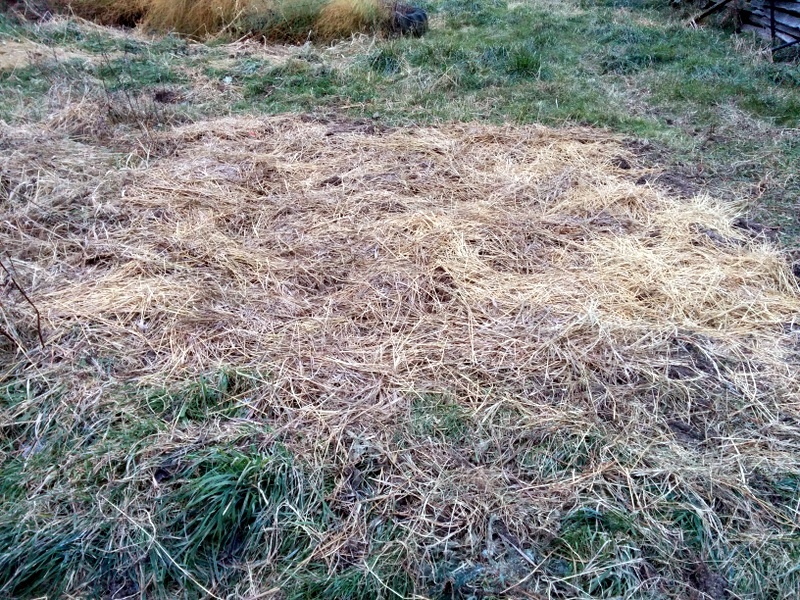 I had some leaves bagged up from 2013 and there is still a fair bit of old hay in the big barn, so I've used both on different beds, as a mini experiment to see how it goes. I'm hoping it will suppress at least some of the early weed growth in the spring. 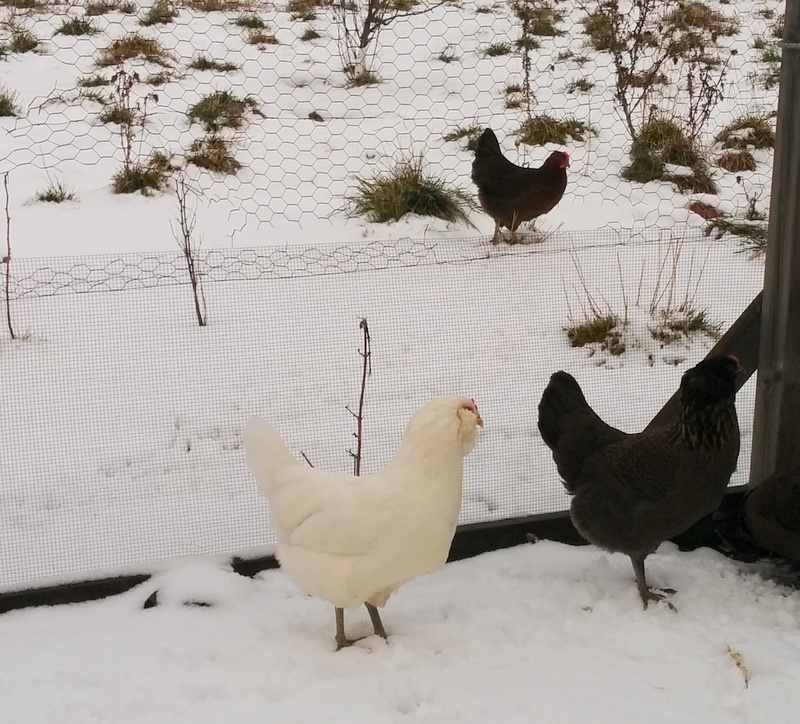 Today was the first day that the new hens had seen snow on the ground. They peeked out at it but decided that it wasn't something they wanted to investigate at close quarters. 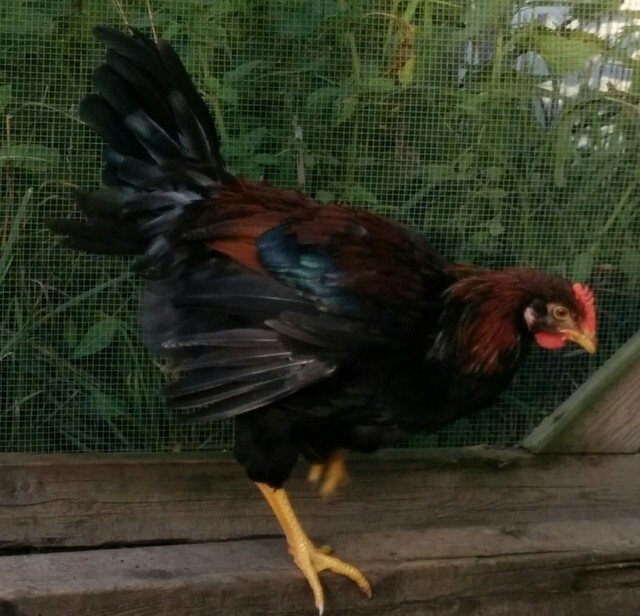 We've been getting a few more eggs of late - two or three of the Ameraucanas have been laying for a month now, and this week we got the first dark brown egg from one of the Barnevelder or Welsummer hens. The Ameraucanas lay a double-yolked egg every so often - the one on the left of this photo, much bigger than the one on the right, will probably have two yolks. 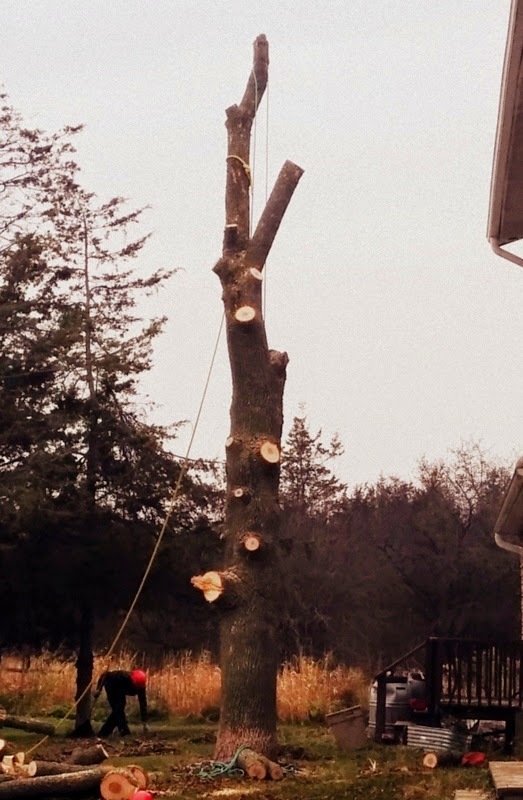 A sad day today as we watched three tree surgeons take down the big ash tree at the rear of the house. 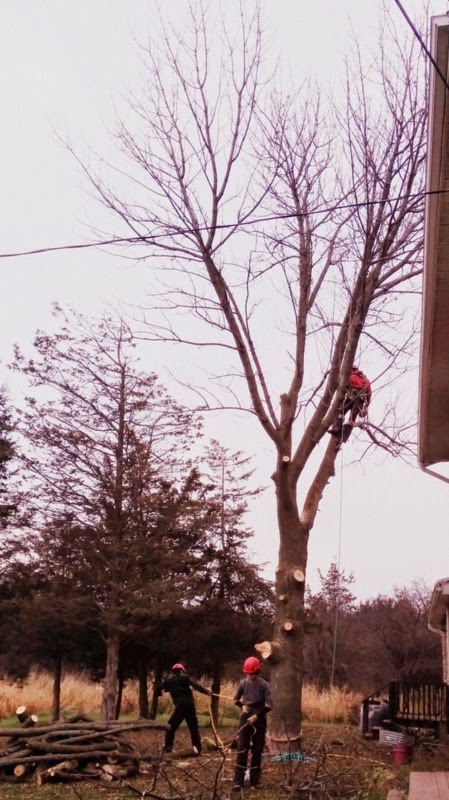 It was very close to the property and with the advance of the Emerald Ash Borer through Ontario, it seemed sensible to anticipate the inevitable and remove the whole tree rather than just the branches which were overhanging the house. I didn't envy the three arborists their job, but they were very methodical about it, with the lower limbs going first, and then the upper ones. Until all that was left was the central trunk to come down. There is an impressive amount of burnable wood left for Mike to cut into smaller lengths for the fire. I counted the rings in the lower part of the trunk and I think the tree was 64 years old. Our house was built in the early 1970s, so the tree was already 20 years old then. It's amazing how much lighter it is in the house with the tree down, even with no leaves on it! 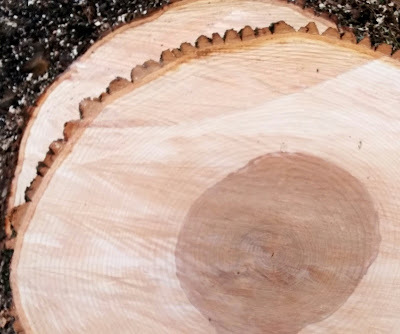 The Emerald Ash Borer beetle is munching its way towards us from southwestern Ontario. 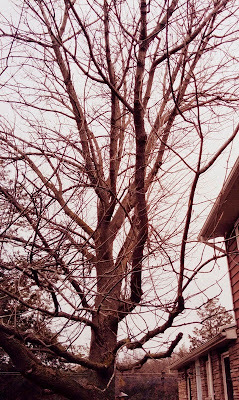 On Friday I was talking to an arborist who works to the west of Toronto. 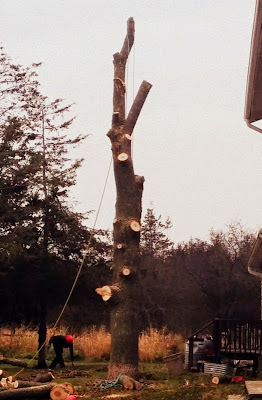 He told me that he is spending nearly all his time now cutting down dead ash trees. Since most of our area of woodland is ash, I spend a lot of time thinking about how this pest is going to impact our landscape when it arrives here. At this time of year, when the ash trees have lost their leaves, I wander through the woods to see what other deciduous trees there are: they're easier to spot when the ash are bare. We have some birch and oak trees, but very few compared to all the ash. On the bright side, we won't be short of firewood in the future, but I think I'd rather have the living trees. It has been a spectacular Fall this year. Some years the colours are over in a flash, but this year they seem to have lasted for weeks. Today I was introduced to the concept of the '200 year present'. For any individual, this is the span encompassed by the birth of the oldest person they have known and the death of the youngest person they will ever know. It is an idea credited to Quaker sociologist Elise Boulding and there is something about it which immediately struck me as significant. Coincidentally, today is exactly 100 years since the birth of the oldest person I can claim to have known well, my maternal grandmother, Edna, who was known to her friends as 'Tommy' and who moved in with my family when I was twelve, just after my grandfather died (that's them on the right in a photo taken at my uncle's wedding, when I think Tommy would have been 49, just a bit older than I am now). This anniversary, I judge, places me exactly in the middle of my own 200 year span of presence on this planet. And it's ironic, because I've spent much of my time in recent months buried in research on the local impact of the First World War: writing blog post after blog post whose titles begin '100 years ago:...'. Those 100 year anniversaries of army enlistments and horrific deaths have become something of an obsession, so perhaps it was not surprising that I remembered this more personally-relevant anniversary today. Not that I don't think about my grandmother often. I didn't really like her very much (it feels shocking to write that, but it's the truth) and she had a big impact on my life. She lived with us throughout my teenage years and affected our family dynamic in fairly major ways. I generally resented her, and I think the feeling was mutual. Possibly I was more like her than I would have ever admitted at the time, and I think having her in my life was in some ways like having a glimpse into my own future. I'm fairly sure I deliberately made myself less like her (more caring, more compassionate, less selfish) as a consequence of seeing the way she treated other people, and my mother in particular. I've been thinking about that difficult relationship more often of late, because we're still hoping to bring Mike's mother (another Edna) over to Canada to live with us (she had her medical last weekend, so we're now waiting to hear the result of that). If that plan works, we'll be extending another family-of-four into a family-of-five and I can't help but worry about how that might change things for all of us. But with a 200-year-perspective view, I think that having her here will bring benefits for all of us, as well as challenges. It will broaden our field of vision and show us our life here through another perspective, as well as remind us all that nothing ever stays the same for very long. In quiet moments in the past few weeks I've been shelling my dry bean crop. There's something very satisfying about this job: popping out the beans and watching their respective piles grow. I'll be saving some of these to re-sow next year, but there should be a good few meals out of this harvest, too. Clockwise from the top they are Deseronto Potato, Early Mohawk, Jacob's Cattle, Hidatsa Red and Cherokee Trail of Tears. 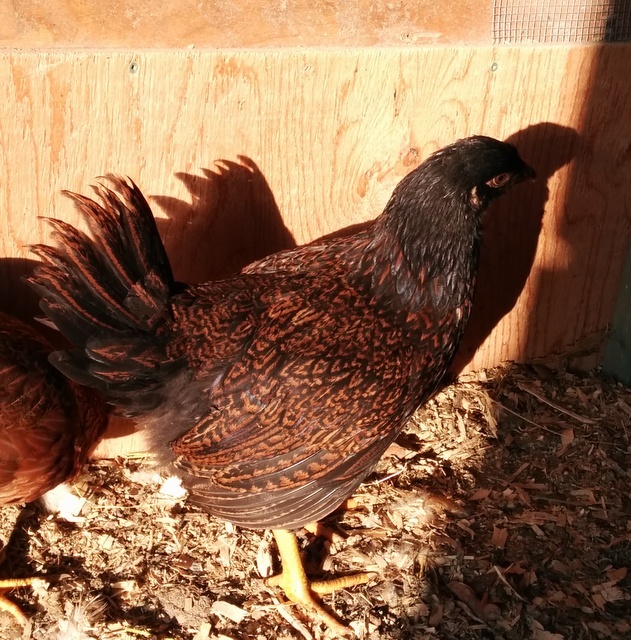 This week I introduced the new chickens to the old ones. They are now sixteen weeks old and big enough not to be too picked-upon by the Buff Orpingtons. 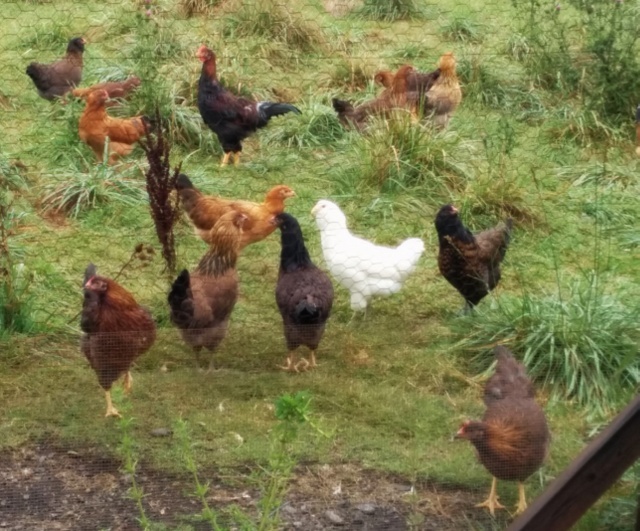 The new chickens are still sleeping in a different area at night, but during the day they are now free to explore outside and it's great to see them pecking at the grass in the orchard. The two flocks are mostly keeping to themselves at the moment, but I imagine that will change as they become more accustomed to each other. 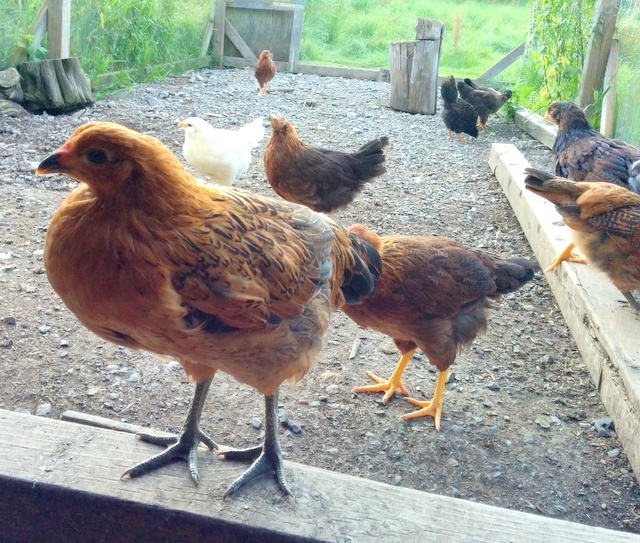 Part of my rationale in getting more hens was to improve the proportions of males to females (which was 1:7). One of the new Welsummers is looking distinctly male, however, so that aspect of my plan hasn't worked as expected! 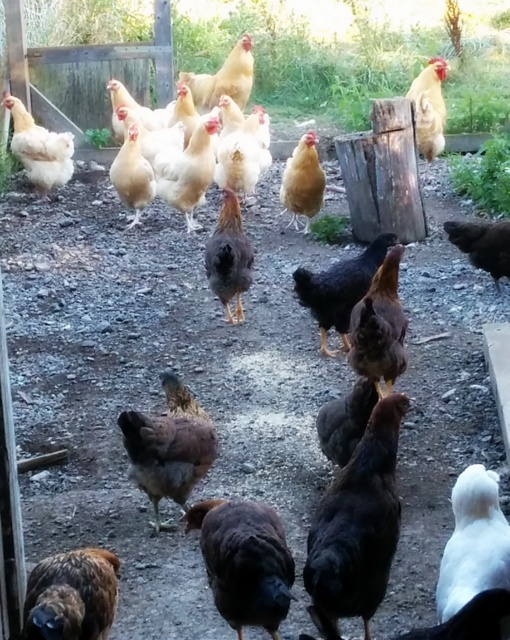 But with the 19 new hens, the ratio is now one male to eleven females so it has improved a little. It's been a weird summer for crops. The tomatoes are limping along, producing modest amounts, but nothing like what we'd get in a regular year. It just hasn't been warm enough. 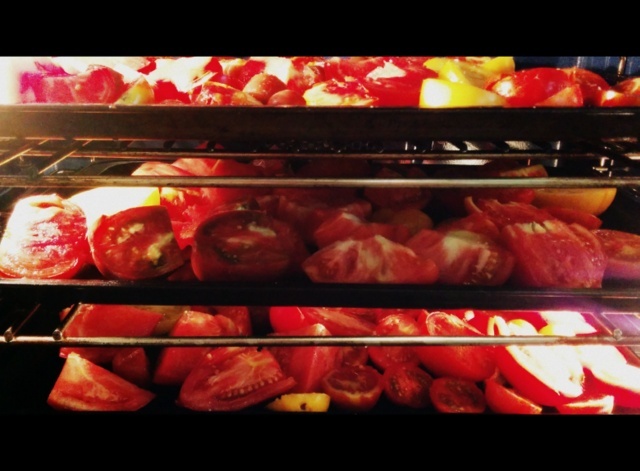 This year I've been roasting, rather than boiling the tomato crop. It seems less labour intensive. I still have to put the roasted tomatoes through the food mill to turn them into sauce, but this cuts out the food-processor stage and (more importantly) produces a richer-tasting sauce, I think. 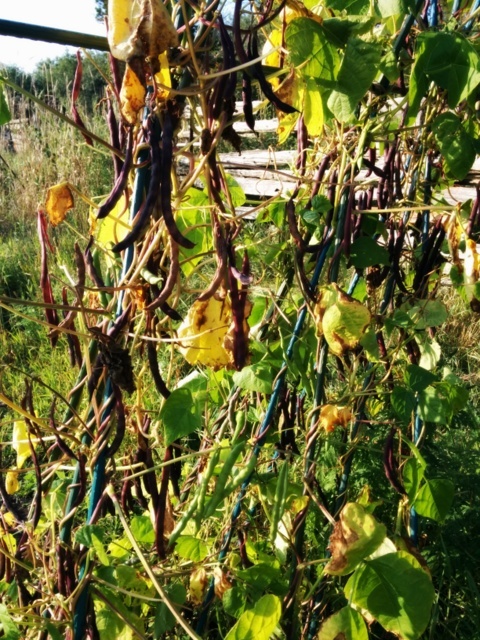 The weather seems to have suited the beans this year, though. I think I will get a good crop of dried beans. If I were allowed to grow only one variety, I think I'd go for the Cherokee Trail of Tears black beans - they're so prolific! My eggplants have been pathetic from the very beginning, even though they're in the greenhouse. But there are flowers coming on them now, so I might get a few before the summer is over, if I'm lucky. 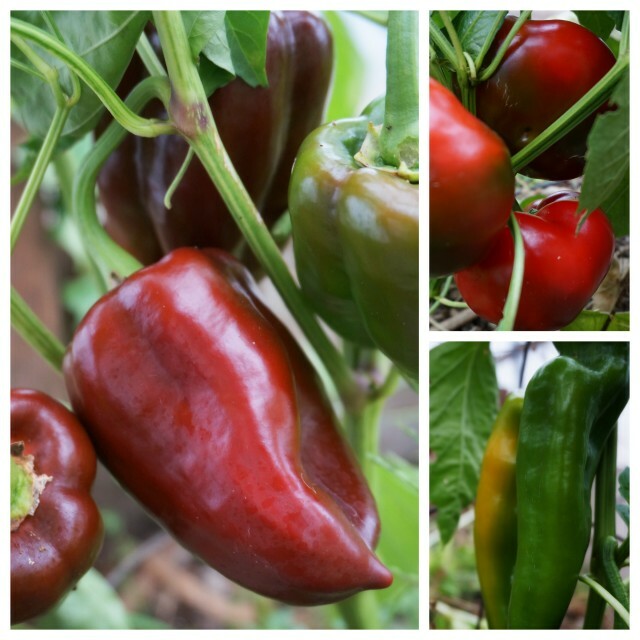 The peppers have been producing well in there, however, and the Golden Marconi ones are just beginning to change colour. Outside, only the skinny Cayenne peppers look like they'll come to anything this year. These are great for pickling or freezing - wonderful for adding a bit of kick to a dish. It would be hard to choose just one pepper to grow, but I think Cayenne would get my vote. As for tomatoes, that's really hard to decide. I think Amish Paste would have to get my vote, from a preserving point of view. But if I'm allowed one for fresh eating too, it would have to be Gardener's Delight. Or Black Cherry. No, sorry, it's not possible. 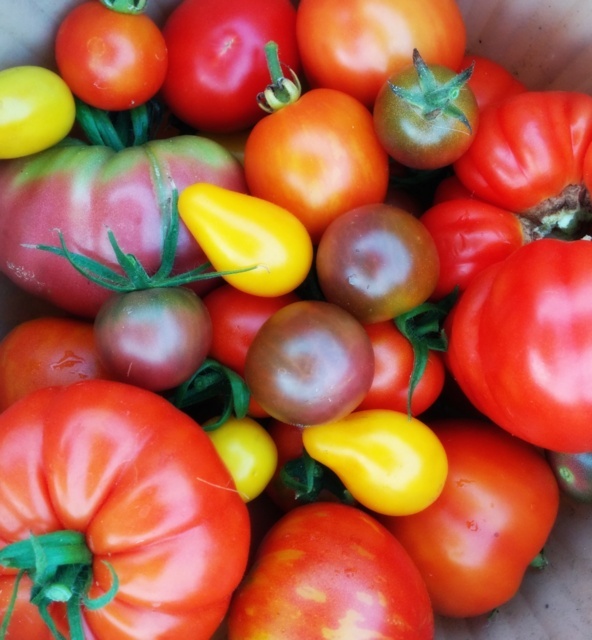 Cannot pick just one tomato! 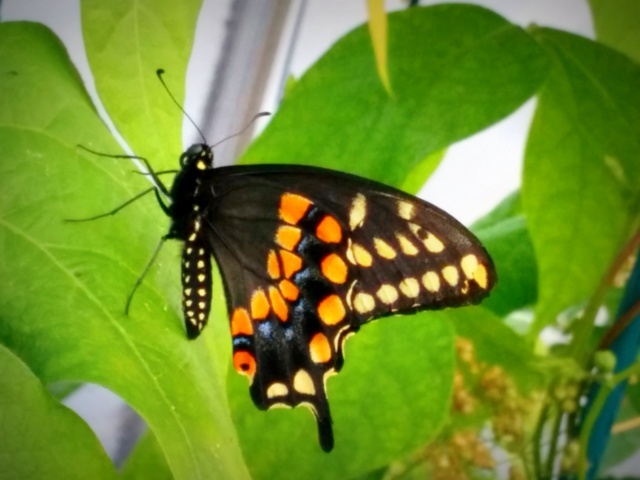 I took Mike's mum back to England last week and was able to squeeze in a visit to Wisley with my aunt. We had a great day and I feel like I've topped up my annual peering-at-plants requirement. Although the downside to visiting amazing gardens like this is the resulting huge sense of inadequacy I experience when I think about my own! 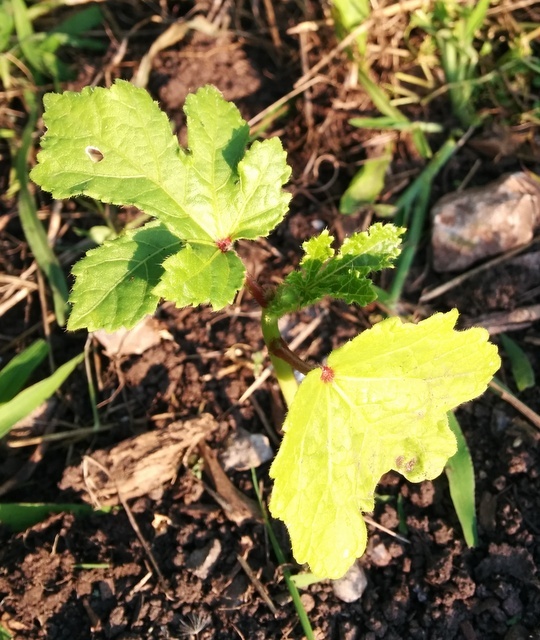 The coolish summer we're having has been testing for my okra-growing experiment with the 'Clemson spineless' seeds I received from Baker Creek Heirloom Seeds.Of the eight or so plants I put outside, only two have survived and this is the healthier-looking one. It's reached the giddy height of four inches: rather shorter than the six or eight feet I'd been reading about! The two plants I put in the greenhouse are doing slightly better and I've picked a few okra pods from them already. 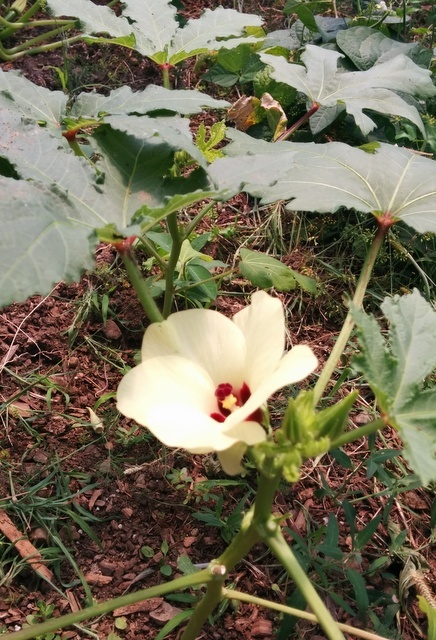 They are still only eighteen inches (50cm) tall, but at least they are showing me how okra is supposed to behave. The flowers are rather like a morning glory and, like morning glories, they only last for a single day. 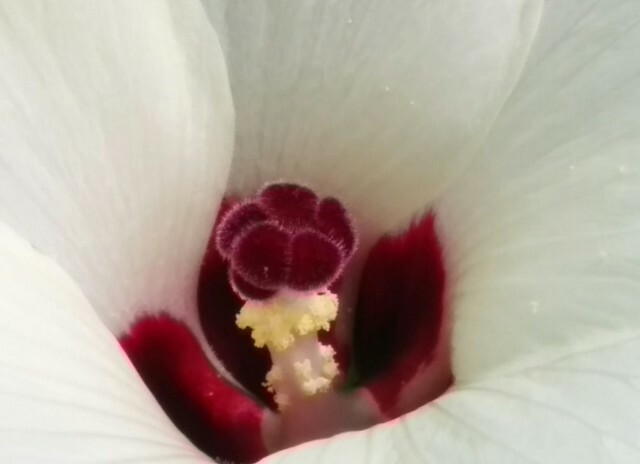 The flowers are self-pollinating - I love the velvety appearance of the stigma. 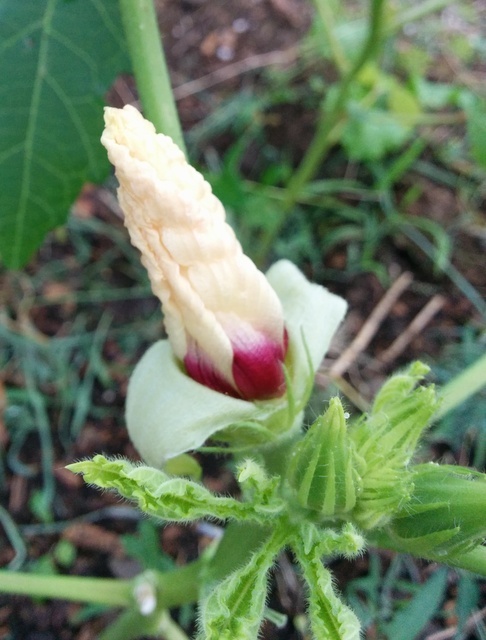 By the end of the day, the flower has shrivelled and the okra pod is ready to form. 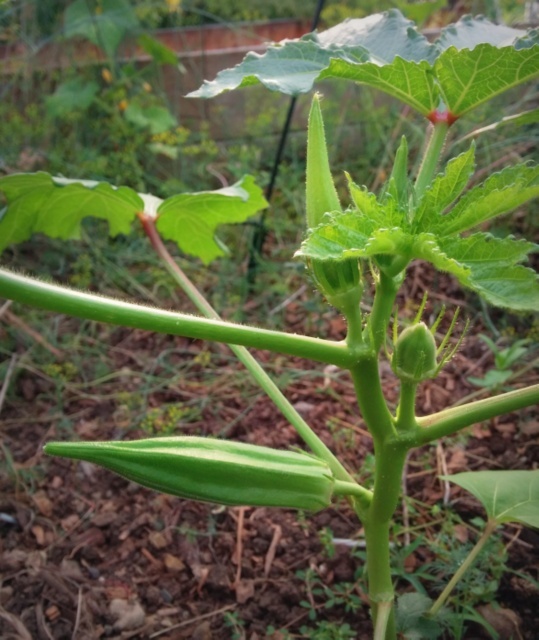 On this plant you can see a flower bud before it opens at the top of the plant, an okra pod just forming on the right and a fully-formed pod at the bottom. In a hotter summer it might be worth growing these outside, but I think from now on I'll treat them as a greenhouse crop. The barn swallows have fledged and are learning to fly. 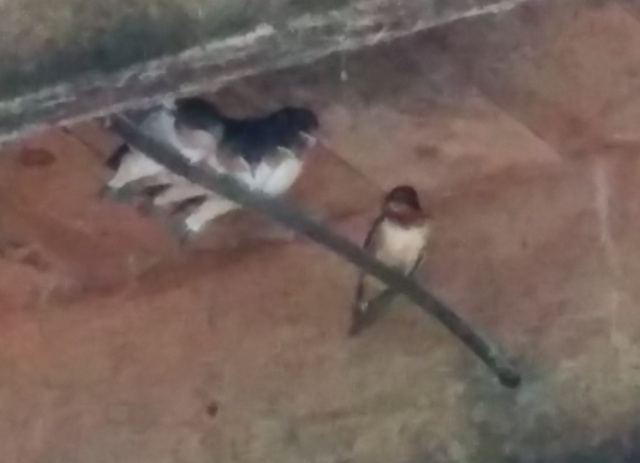 This morning the adult swallow seemed to be giving the four youngsters a pep talk in the barn. 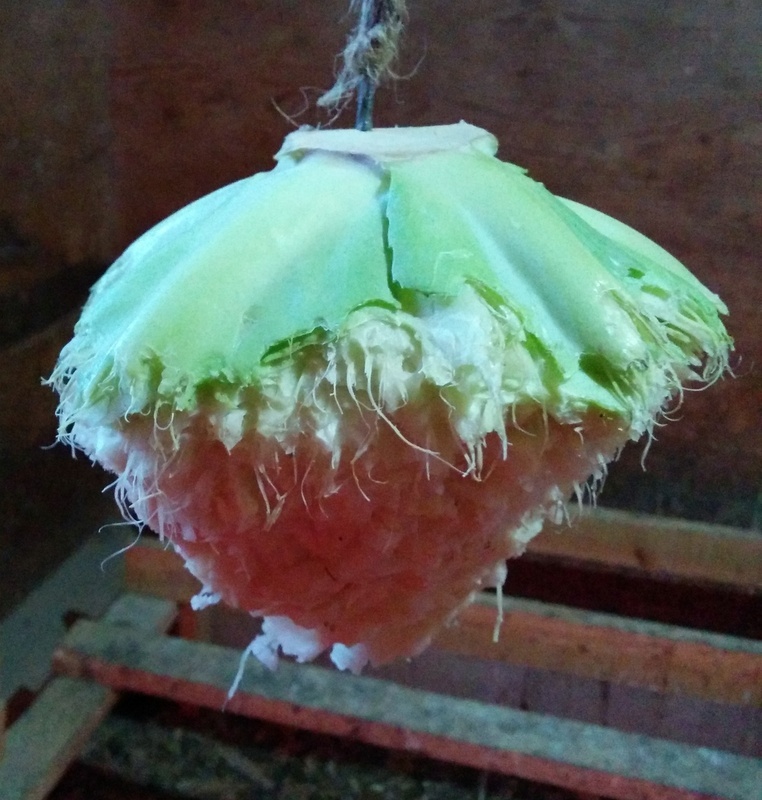 Two robin broods have already been hatched and fledged in the barn this year and now there's another four eggs being incubated in another robin nest in there. I'm not sure if it's the same robin or a different one. I'd noticed signs for the Quilt Show around the county in previous years, but had never attended it before. With Mike's mum staying with us, it sounded like the sort of thing she might enjoy so we went along to it this morning. I was amazed at the scale of the event - quilts as far as the eye could see, taking up the entire floor space of the arena in Wellington. 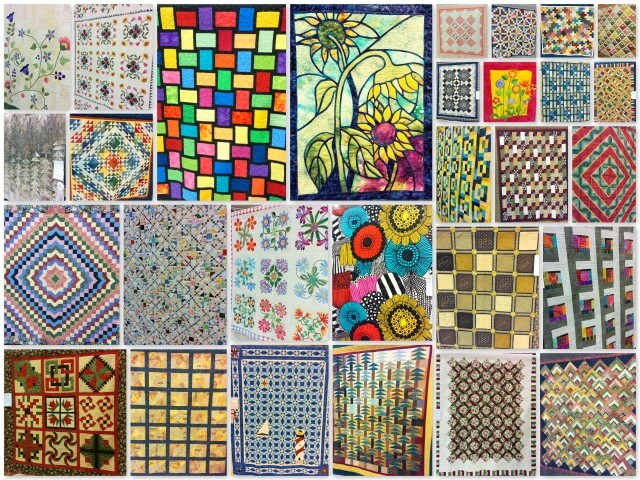 I know nothing whatever about quilting, but even as a complete ignoramus I could not help but be impressed at the intricacy of the designs and the time commitment that each quilt represents. They really are works of art and I have huge respect for the creators of these pieces. I loved the way that they varied from the very traditional to the more modern and abstract. The vendors' displays were beautiful, too. 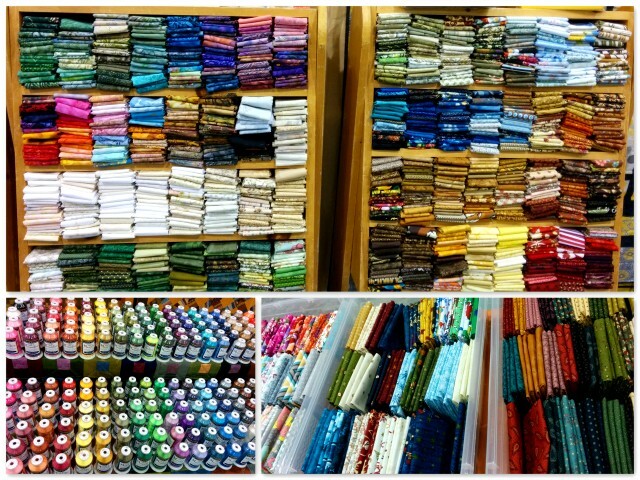 It was almost enough to make me want to take up quilting. It's that time of year when the sky lights up with fireworks and the humidity drives people to seek comfort in iced desserts. Today I harvested two pounds of gooseberries and turned half of them into ice cream. I have found a local supermarket that sells 35% whipping cream with no added ingredients (hurrah!) and today they were selling them at half price. I bought four pints and used two of them to make this and a batch of vanilla. The other week I was called upon to make a lactose- and gluten-free iced dessert. I thought it would be hard, but it was quite straightforward: easier than a custard-based version anyway. I started with quartered strawberries and sugar, letting them mash for a while, then blended those to a liquid and pressed it through a fine sieve to remove most of the pips. I used two cans of coconut milk (the highest fat one I could find) and heated them up to make sure the oil and solids were smoothly combined (they tend to separate in the can). Then I stirred the coconut milk into the strawberry mixture and froze it in the ice cream maker. It certainly looked pretty. I melted half a cup of cocoa, a cup or so of sugar, and a bar of 75% chocolate in another can of coconut milk and then stirred in two more cans and some vanilla extract for the chocolate version. Apparently they went down well!